She is six and half years old. Not a baby, or a toddler. Our youngest child, but growing so fast it hurts a little bit. I know there are years ahead, and plenty to look forward too. I know too that the time we have is fleeting. On her field trip to Old Town, while eating her peach... I noticed the gap. The tiny space where the wriggly little tooth sat... It must have gone with the peach! What a shame,and I thought for a moment of the box my cousin Beckie de LR gave us at the baby shower, the pretty one for the first baby tooth, and of the tooth fairy pillow from cousin Julie... waiting expectantly for this occasion. But, happening like this, the loss of her first tooth is perhaps even more memorable than if things had gone as anticipated. Her girlfriends, Macy and Aurora, Mia, Sophia... they noticed and exclaimed, and they all exchanged shocked and awed expressions about the whereabouts of the lost tooth. Their faces were priceless. Maria was sad, then shy, then amused. 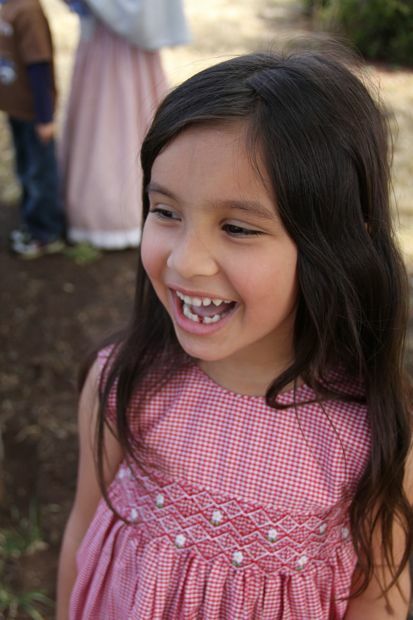 Her friends hopeful, the tooth fairy would not forsake her. The tooth fairy did not forsake her. Maybe the lovely letter and picture Maria made for the fairy did the trick, or maybe because it's me. I am the tooth fairy. Maria guessed this, with a proud new grin, and she thinks it's lovely that her very own mommy makes magic happen for her. Oh, time. It really is fleeting. The loss of the first tooth - always a sweet memory - specially with the peach! Mateo's first tooth came out one Christmas Eve - and his second on New Year's Eve! I'll always remember. Oh, I remember losing my first tooth. I have no children, but I also remember when my first dog lost a puppy tooth! He got a cookie... What did the tooth fairy bring Maria? In my day it was a dime, and it felt like a million bucks. What a milestone! I think it's cool that she can consciously engage in the fun of magic. What a beautiful daughter you have. Isn't it fun to commemorate how the first tooth was lost! I think I was eating pho when I lost mine. I think it was scary losing my front teeth... I fell and knocked mine out ... separate... running and tripping on the asphalt! Happy six and a half years old!! We are glad you are here!! Chicken Blog and Maria both! She is growing up so quickly!! Just beautiful, enjoy her while you can! I am glad to see you back! And it sounds like Maria's first missing tooth will be a memorable experience for her - how great to have made a "big deal" of the moment. Oh my goodness! The tooth faerie knows all ... After her friends acknowledged it and the tooth faerie delivered, she looks like she is very proud. Good for you Maria. I was sure I was going to cry... when it first became loose, the realization of her growing up really overcame me. It would have been a mess for me to burst into tears though, when she was already alarmed by what happened, so we were both of us being *brave. * All of your first tooth tales are so sweet. Thank you for sharing your stories, and your kindness.